This book by Yoder addresses the very implications of Jesus' radical love. 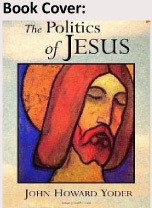 Although the author uses New Testament scholarly results of not later than 1972, it is still worthwhile to read this excellent book on Yoder's interpretation of the historical message of Jesus and the implications for an ethical and political understanding of this message. Jesus' kingdom message should not be interpreted as a spiritual kingdom. Jesus made a political choice against the powers of his times. It is an alternative way of life, of non-violent resistance through radical love to the usual (often unjust) political rule, but it is an outspoken political choice. Chapters on the possibility of a messianic ethics, the coming of the kingdom, the option of non-violent resistance, the fact that the disciples of Jesus followed him to the end, and Christ and power, carry a richness of insights for our own situation. This book makes sense for us today in our own struggle for a peaceful, non-violent and just society in South Africa. It is a great challenge to the churches and to Christians in our situation to start living and witnessing in the spirit of Jesus' kingdom message in our efforts to, inter alia, bring about economic justice.